Dvaid Clifford won an All-Star this season in his debut senior year. 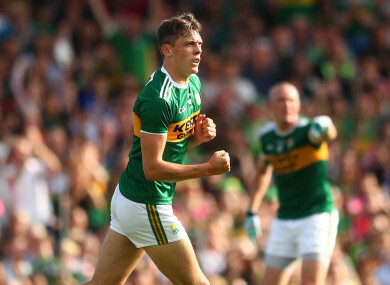 KERRY’S YOUNG ATTACKER star David Clifford is on course to feature for the county in next spring’s Allianz football league as he is not set to undergo a shoulder operation. It had been reported last month that the teenager would have to go under the knife and would be sidelined for the early months of the 2019 campaign. But the Fossa player, who enjoyed an exceptional season in his first in the senior inter-county ranks, has revealed it is not planned to have an operation to repair the injury. “No, hopefully not now,” replied Clifford about the prospect of surgery when he spoke in Philadelphia on the 2018 PWC All-Stars tour. His exploits for Kerry minor teams and St Brendan’s Hogan Cup sides sparked plenty of attention in the progress of Clifford as he stepped up to the senior grade in 2018. He had plenty praise for Eamonn Fitzmaurice, who stepped down as Kerry boss after their Super 8s exit, for his role in helping him adjust. “I will be forever thankful to Eamonn for giving me the chance. The professionalism of that man is something to behold, it is ridiculous in that every single minor little detail was covered. He was unbelievable. The Kerry players know how thankful we are to him. “I was not going so well in the league and he stuck with me. I started in the first championship game then and that was a massive lift for me. It relieved a small bit of the pressure the fact that I was in (the team). He was unbelievable. A third year student in Health and Leisure in IT Tralee, Clifford had been liked with a potential move to AFL clubs but that was an example of hype and speculation that he sought to detach himself from. “There are loads of fellows out there, be it my friends and people in the club who would bring you back down to earth straight away if they thought you were getting too big-headed. You try and avoid the hype and that is what I tend to do. Having worked closely alongside Peter Keane at minor level, he is looking forward to seeing the Caherciveen native put his stamp on the senior side next year. Clifford will be seeking to replicate the eye-catching scoring shows he produced this season. His rise has naturally drawn comparisons with another Killarney attacking star but he did not just look to emulate Dr Crokes star Colm Cooper when he was younger. “I would have met him a few times briefly alright. I totally idolised him growing up and still do and it is more a case of trying to imitate a lot of the things he did when he played for Kerry. It is great to have idols like. Email “Avoiding shoulder surgery, dealing with Kerry hype and an Armagh attacking idol”. Feedback on “Avoiding shoulder surgery, dealing with Kerry hype and an Armagh attacking idol”.